This was a wonderful evening. These boys had spent the evening dancing across the surface of the sea with the wind and the surf. They had sat on their boards, watching the horizon, looking for any wave that caught their eyes. It did not have to be the perfect wave, the moment was perfect sitting on the gently rolling swells, only occasionally speaking with each other. Even now, as they leave the sea, walking beside each other, they spoke not a word. The rhythm of the surf breaking against the pilings of the pier, and the call of the gulls, was all that could be heard. The boys of the sun were on their way forward, leaving their love behind, to rejoin common man. 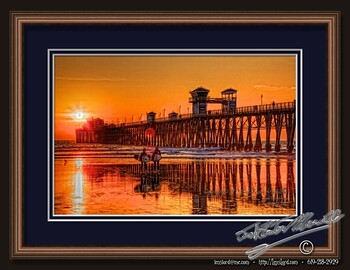 This entry was posted in Groups, Landscape, Lovely Light, Man, Painterly, Purchasable - As Art Prints, Sea, Sunset, Water. Bookmark the permalink.